Take some time to warm up this weekend and check out these awesome links! the tiemann girls are crushing on Essie's new spring nail colors! And because they are loving them so much they are giving some away! Check out their little giveaway. free to be stacia lee is keeping warm in bright pink! I love bold colors like this for winter, it makes the grey days bearable! live a lot has another fun winter look - she went without tights, but if it's cooler where you are, just add tights! Check out her look. Did you find any new favorites last week? What are some of your most loved blogs (aka stalk them everyday for new posts kind of love)? Have you come across any new comers that you like? Hi Jessica! 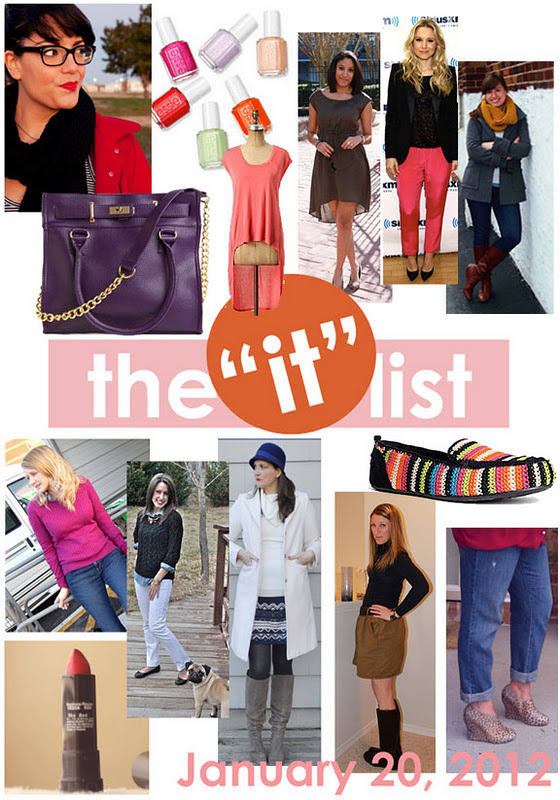 GREAT "it" list :) its making me long for spring with all those beautiful brights! Just wanted to also let you know you are my giveaway winner! Just sent you an email with the details.